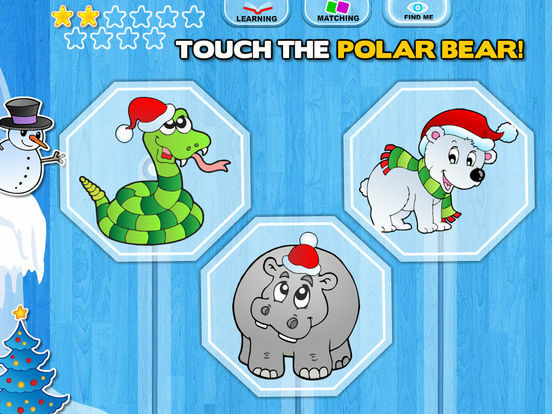 Children's favorite animals on farm and zoo are coming to your homes. This time, in a classical charming winter theme. Enjoy their overwhelming cuteness. You will love learning with them! 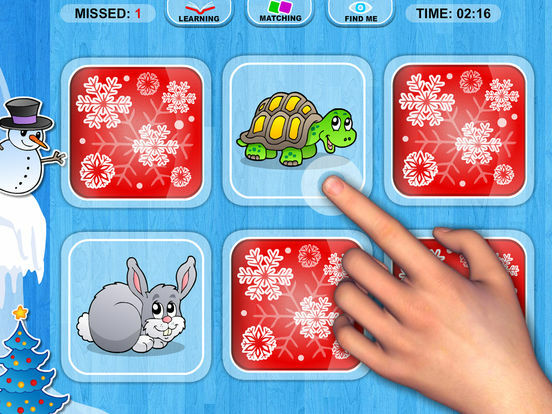 3 games in one app, endless space for exploration, Abby – Amazing Farm and Zoo Winter Animals application is a new application by 22learn from the extremely successful Abby series devoted especially to curious toddlers. Cute picture, heart-melting photos, and classical holiday music are sure to incite your kids' imagination, exploration and desire to learn! 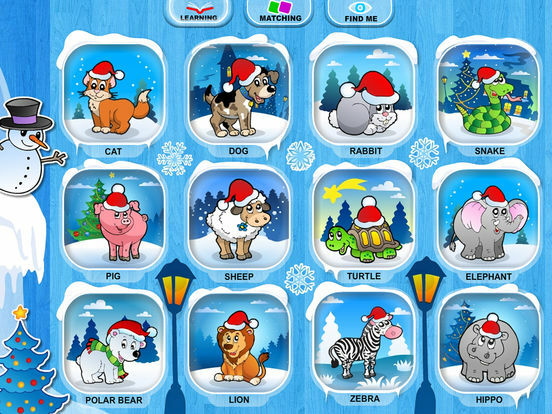 Let's celebrate holidays together with lovely characters of cat, dog, bunny, pig, sheep, turtle, elephant, snake, polar bear, lion, zebra, and hippo! To make the use of the app as easy as possible for the little ones, we included no complicated menus in this app. Switching the playing modes (Learning, Matching, and Find Me!) can be done directly from the main screen! This mode is especially created for curious minds who want to explore on their own. Once you choose this mode, you will see drawings of all the animals displayed on the main screen. 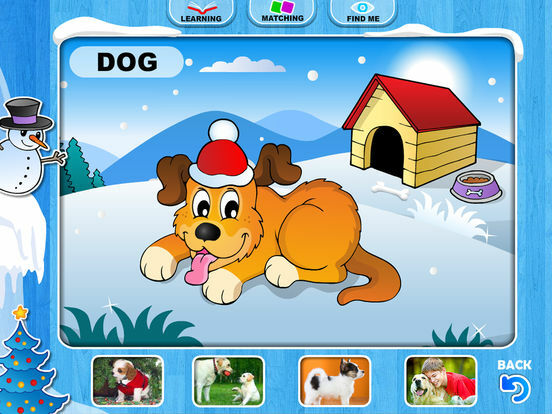 Tap on the animal you want to play with and you will be directed to its page. There, you can play with it by tapping on it and observing its animations and sounds or browsing through additional photos by tapping on photo miniatures below the animal! You can also hear its name by tapping on the written animal name placed next to the animal. In this classical memory game, your task is to find two identical photos. Listen to the animal sounds while playing and learn the animal names by hearing them pronounced once you find the right matching cards! To modify difficulty of this game, go to the Settings and choose one of the four difficulty levels: Easy (6 cards), Medium (12 cards), Hard (16 cards), or Expert (20 cards). This mode enables you to test your knowledge! Embark on the ultimate challenge! The task is always to tap on the animal whose name is called! To modify the difficulty, go to the Settings and choose the minimum and maximum numbers of animals that you will be choosing from. 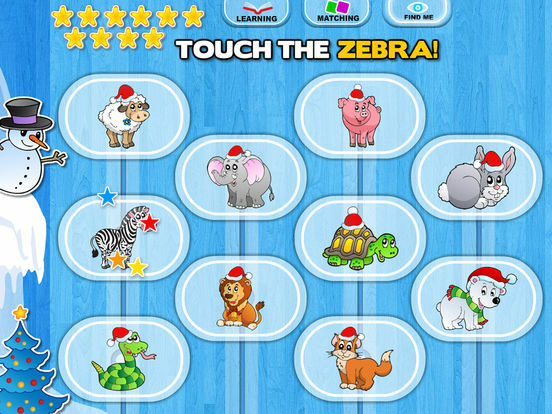 For the youngest children, choose a maximum of two animals and add some difficulty once you see they have mastered this task. Even if they are initially making mistakes, they are soon going to learn through the process. For each correct answer, children are awarded one star. Once they have a full star collection, they will see a short congratulatory animation as a reward for all their efforts. So don’t wait and start exploring! Our animals are eager to meet you all!